Belt Buckle Archives - TMRnyc - Total Metal Resource, Inc. This week, TMRnyc’s limited edition, hand-signed and –numbered RetroCard Belt Buckle is being featured on the exclusive (and quite addictive) shopping site, Fab.com as one of this year’s “100+ Best Gifts Under $100.” Buy now from Fab.com, and get it before December 23rd. At a special sale price available only through Fab.com, everyone’s favorite cool belt buckle is just $98 which includes a black or brown belt. You’ll need to register for a Fab.com account and wait to be admitted, but you can jump the queue by inviting some of your Facebook friends. Touted by the fab folks at Fab.com as the perfect gift for those who love “Inspector Gadget-worthy personal effects with a utilitarian touch,” the RetroCard Belt Buckle makes the cut this year among Fab’s affordable gift recommendations. What makes our handmade belt buckle worthy of inclusion on this varied list of gift-giving bliss? Like nearly everything else on the list, this manly belt buckle has much more to it than meets the eye. Crafted of a hot-rolled steel front plate and blackened steel backplate, the RetroCard Belt Buckle is a sleek steel buckle that will develop a unique patina with wear over time. The hidden beauty of this piece, however, is that it sports a concealed, felt-lined compartment between the plates in which commuters can stash (and easily access) their MetroCards or other transportation passes. Hop on over to Fab.com and pick one up for the Inspector Gadget on your holiday list. We live in a fast-paced world. We rush from place to place, taking calls at all hours and working on the go. For city commuters, catching the subway while toting a briefcase, purse, cell phone, coat, or packages can be a particular challenge. The little things that make our hectic lifestyle a bit more manageable are not only appreciated, they’re becoming essential; and the RetroCard Belt Buckle from TMRnyc is one of them. 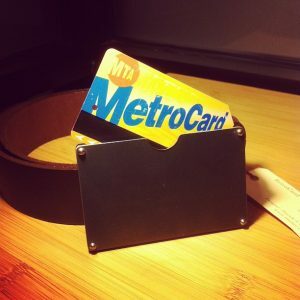 The RetroCard Belt Buckle is a retro-styled, rolled steel fashion statement that keeps your MetroCard handy at all times. 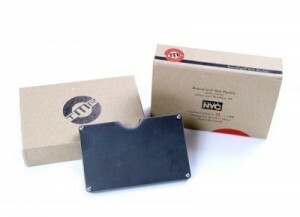 Handmade right here in Brooklyn, New York, the buckle is crafted with a slim, notched, felt-lined compartment perfectly sized to fit your MetroCard. For New Yorkers on the go, this easy access means you’ll never miss a train because you can’t find your MetroCard in your wallet or can’t find your wallet in your purse. You simply slide the card right out of your belt buckle, and put it right back in. Designed for use with any button-snap belt, the RetroCard Belt Buckle does more than prevent you from having to dig around for your MetroCard and help you get on the train faster. It also helps you commute more safely. How often have you dropped a credit card or business card while pulling your MetroCard out of your wallet? Or dropped your phone while getting that wallet out of your pocket or purse? With your MetroCard (or any public transportation fare card) right at your waist, yet snuggly fit into your belt buckle, there’s no need to take out your wallet or open your purse in a crowded subway station. With its sweet new packaging, the RetroCard Belt Buckle makes a great gift for the guy who has everything this holiday season. 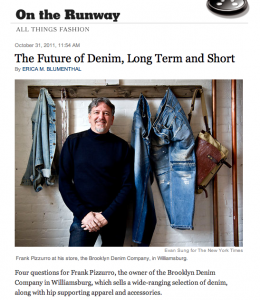 Frank Pizzurro, owner of Brooklyn jean shop, Brooklyn Denim Company in Williamsburg, was featured Tuesday in the NY Times — The Future of Denim, Long Term and Short — answering questions about his store and the world of denim. Not only can you find all styles of denim at Brooklyn Denim Company, but you can also find the RetroCard Belt Buckle. It’s the perfect accessory to go with a new pair of jeans and makes a great gift for the guy who has everything! Scott Behr, founder of Total Metal Resource, can often be found (sometimes in the middle of the night!) 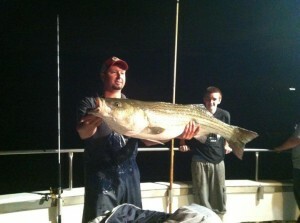 at the India St. pier in Greenpoint fishing for bluefish or striped bass. He hooked up with the Brooklyn Urban Anglers Association who are hosting their 3rd Annual BKUAA Brooklyn Fishing Derby through the month of October, and Scott gave them an offer they just couldn’t refuse in the form of a sweet donation to the prize pool. One lucky derby grand prize winner who catches the largest Striped Bass will walk away with a RetroCard Belt Buckle at the end of the derby. If you needed another reason to get your derby on, this is it. For the (fisher) man who needs his hands free to carry his pole and tackle, the RetroCard Belt Buckle is the ultimate derby prize.